When you’re craving a break from the city, and only have a day to play with, jump in a car and drive just 50 minutes north of Sydney to the luscious Ku-ring-gai National Park for hiking tracks, lookouts, wildlife, and the hidden gem Cottage Point. We set off on our park adventure at 8am and were back in Sydney by 2.30pm after a good hike along the American Bay track (with an awesome view of Cowan Creek) and a waterside bite to eat at the Cottage Point Kiosk (one of our absolute favourite spots that we’ve stumbled across to date – read on to find out more). Get straight onto the M1 out of Sydney and head north on the A3 – before you know it you’ll be winding your way through the beautiful forest hills of Ku-ring-gai and being tempted to stop at every lookout point. Head to the American Bay track and begin your downhill hike of approx. 30 mins through bushland and rivers to reach the ultimate view – American Bay Lookout. Head back on the same track to get back to your starting point, and drive 5 mins north to the very top of the national park – West Head lookout. Here you’ll get a fantastic view of the famous Barranjoey lighthouse, Pittwater, Broken Bay and surrounding areas. Take the West Head Army track if you want to get closer to the ocean, or simply take in the views from the top. If you’re a keen cyclist this is where you’ll finish your big climb through the park and earn yourself a well deserved rest with panoramic views. Time to go and grab yourself a nearby spot by the water and enjoy some lovely local coffee – and we have just the spot for you. Cottage Point is a delightful little waterside suburb (the smallest suburb in Sydney) with a tiny population of locals living in rather wonderful houses, and pretty under the radar which is ideal if you’re looking for some peaceful time out. 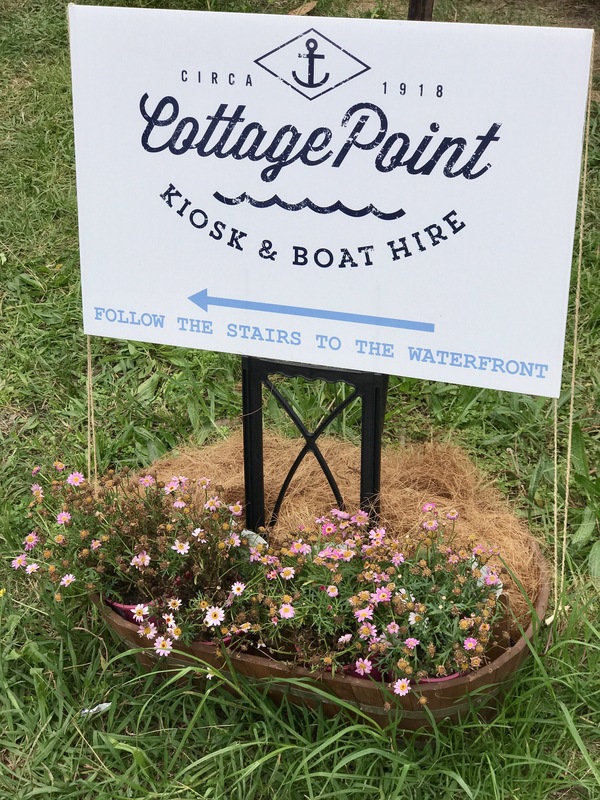 If you’ve heard of Cottage Point before, you might know it for the Cottage Point Inn – a fine dining swanky restaurant offering a 7 course tasting menu (you can even take a sea plane from Rose Bay in Sydney if you really want to live it up). 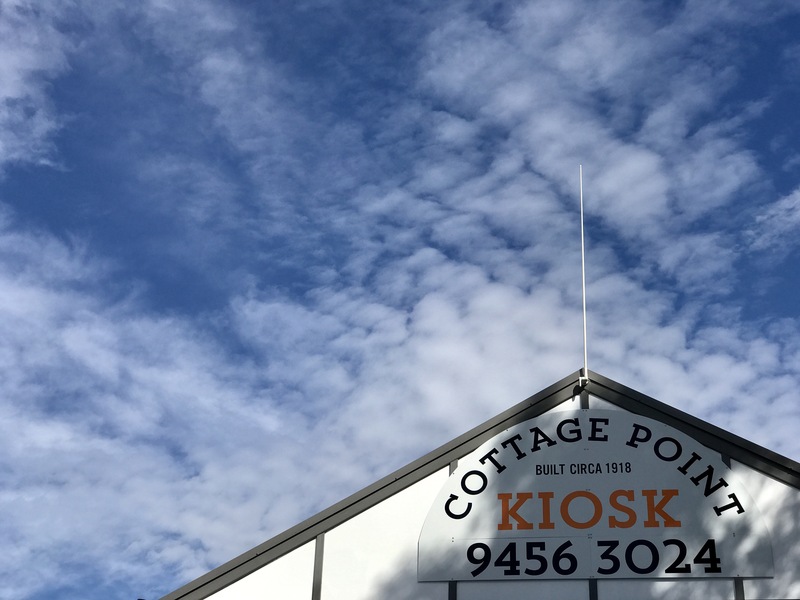 But don’t be blindsided by fine dining and 7 course menus – Cottage Point Inn’s got an incredibly picturesque and welcoming neighbour just along the creek – the Cottage Point Kiosk. As you wind down the steps to the waterside, you’ll be greeted by brightly painted tables, a boating pier for those lucky enough to cruise up on a boat, and friendly smiley staff. Open for brekkie and lunch 7 days a week from 8am – 4pm, we opted for coffee and carrot cake, but we’ve already made plans to return with friends for a long lazy lunch in the sunshine followed by a cruise around the beautiful and tranquil Cowan Creek (you can book a kayak or tinny boat at the kiosk too from just $80 for two hours). We immediately fell in love with this place and it’s charming local atmosphere, which can be so hard to find at waterside spots in and around Sydney. This place is an absolute must for anyone heading to Ku-ring-gai, whether it’s a post hike refresher, or an afternoon boating and lunching – don’t miss out on this great little spot! Thank you for reading it Angela! I’m glad you like it 🙂 We look forward to another trip to Cottage Point Kiosk soon, and another blog post! Hope to see you soon.